Société Générale S.A. is a French multinational banking and financial services company headquartered in Paris. 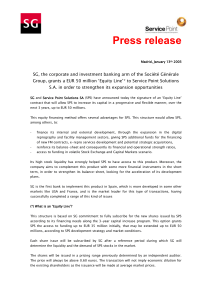 The company is a universal bank and has divisions supporting French Networks, Global Transaction Banking, International Retail Banking, Financial services, Corporate and Investment Banking, Private Banking, Asset Management and Securities Services.Société Générale is France's third largest bank by total assets, seventh largest in Europe or seventeenth by market capitalization.Société Générale is one of the oldest banks in France. Founded in 1864 its original name was Société Générale pour favoriser le développement du commerce et de l'industrie en France (English: General Company to Support the Development of Commerce and Industry in France).